I received an IPhone the other day that would not charge. My first thought was that the logic board was fried from a dodgy charger, since I had come across a similar problem before. 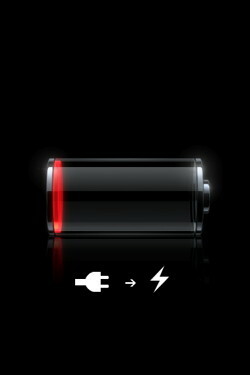 However, there was something different going on in this situation: Whenever the phone was turned on, the apple "i need to charge" (see pic) came up on the screen. When plugged into a charger, it said that it was charging. However, no matter how long it was left charging for, the battery only ever held a charge for a few seconds. 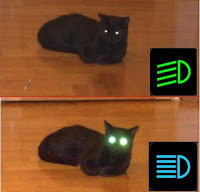 Two things could cause this. A dodgy battery that cannot hold a charge (unlikely, as that would be a very gradual problem: this iphone suddenly couldnt hold a charge) or two, the white wire that monitors the temperature of the battery to help it charge was broken, making the IPhone refuse to charge the battery. Sure enough, after opening it up, this was the problem. The white wire bad broken off the Comms board. I didnt have my trustly weller soldering iron with me at the time, so I set about soldering the wire back on with a cheap 10 dollar fire-starter iron. Of coarse, I got solder all over the pad and the shielding on the comms board. 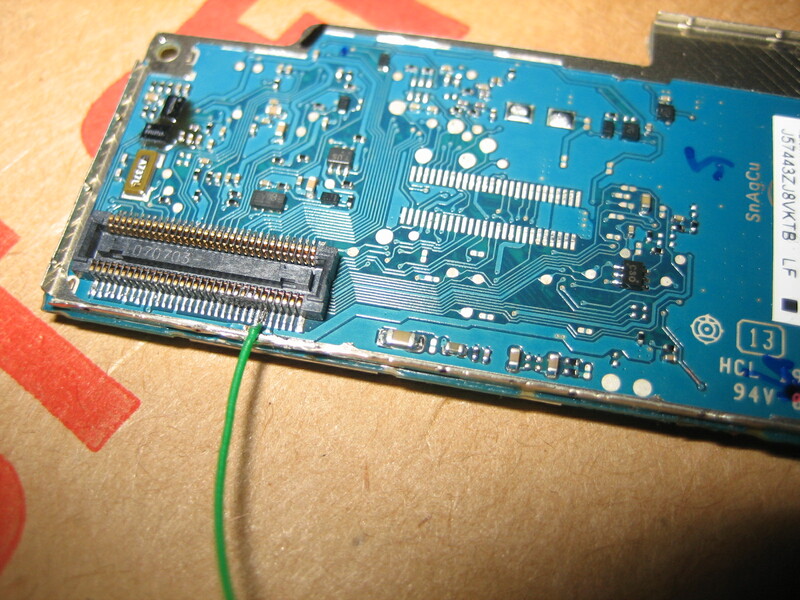 So, as I was feeling quite lazy, i tried to remove the excess solder from the shielding with a small wire snips. The force of the snips had caused the white wire solder pad on the comms board to break off, leaving no where to solder the wire onto.I opened up my own IPhone to try and trace where the pad led to on the board to try and find a new pad that I could solder onto to no avail. After much cursing and swearing, I finally found some information on the net about the pad. As the board is multi-layered, the only place that the pad circuits seems to resurface is at the connecter between the comms board and the logic board. The bad point? 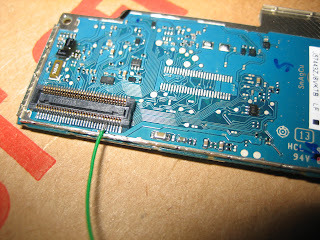 The pitch of the connector was very small, and there was no redundancy, i.e normally manufacturers might carry the signal across a few of the connector pins that I could solder to, however, in this situation, there was only one. So I removed some of the shielding with my Dremmel tool, and with a careful hand, soldered some wire-wrap wire onto the pin. I did accidentally short one of the neighbouring pins to it with solder, but with careful use of a sharp Stanley blade, I separated them again. (I had tried solder braid to remove the solder short to no avail). So I powered up the IPhone, tried to charge it for a while, and was delighted to see that it was charging again. This, and the referring Hackintosh link, saved the day for my son's 2G! My still-steady-at-50 hands were able to microsolder a single strand from some stranded 20AWG, and after slipping a sleeve on it, was good to go! Can you help me to find out what exactly PIN number? If I read the pins from right-to-left, I can say: it was a pin#5, am I correct? Hi, its pin 5 that is to be soldered. Nice thought thanks for share this post this I also share with you something. Only purchase a new part. When it arrives, take a look at the silver back of the LCD. If it’s all scratched up, they didn’t sell you a new part. 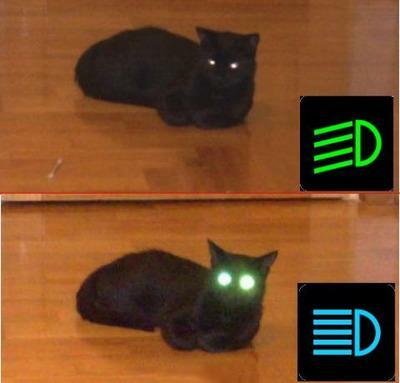 It’s highly likely you were sold a recycled part. The quality of these is suspect at best. Send it back and tell the seller you want a refund. Thanks for providing iphone repairing service. Now a days this is very necessary for us.